Mark your calendars and join us for a weekend of top-notch Salsa dancing !! Jazzy Dance Company brings Jayson Molina from Puerto Rico to Austin, TX for workshops, private lessons, shows and social dancing! If you haven't seen Jayson Molina dance, you ain't seen nothing yet !! 10pm-2am: Social Dancing w/DJ Fabian playing his best tunes! Workshops will be held in the beautiful 2000+ sq. ft. Khabele studio. street and we can also double-park in front of the studio. If you are interested in privates, Jayson will be available on Thursday Sept 11th through Saturday Sept 12th for private lessons. $100 for singles, $175 for couples. Please email me asap if you would like to schedule a private. Congress, attracting over 20,000 people annually. 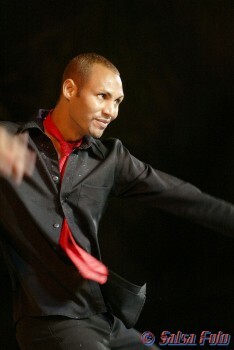 Jayson has been teaching ever since the age of 12, growing up in New York City where the soul in Salsa comes from. Molina has traveled the world spreading the Salsa fever and creating international awareness everywhere his path has taken him. He has shared the stage with stars such as, Tito Puente, Celia Cruz, La Sonora Ponceña, Gilberto Santa Rosa, Tito Nieves, Tito Rojas and Oscar D'Leon. Molina was one of the first to bring Salsa to Europe and because of his love for teaching; he opened up his own dance school in Rome, Italy in 2001. He lived there for almost 4 years dancing with his current partner, Alessandra Lo Piero, and directing his group, Los Rompecabezas, who recently celebrated their Five Year Anniversary with a stellar show at the 2005 Puerto Rico Salsa Congress with an anthological piece highlighting his most famous choreographies. Molina spends about 50 percent of his time away from home – attending congresses, teaching workshops, performing, choreographing and training groups. Apart from Italy and Puerto Rico, he has trained dance companies in places like Spain, Venezuela, Chicago, California, and Germany. Jayson is currently in the process of opening up another exclusive dance school in Puerto Rico, where he resides during the week when he is not traveling abroad.